After the Kansas City race riots in 1968, the police department had a goal to reach 1,500 officers. That goal was never met, and today the department still remains far short of that number. KANSAS CITY, Mo. — Fifty years ago, the Kansas City Police Department had a goal to reach 1,500 officers. That goal was never met, and today the department still remains far short of that number. The goal was set in 1968 after protesters and police clashed following the death of civil rights leader Dr. Martin Luther King Jr. in April of that year. The Kansas City race riots led to six deaths, dozens of injuries and millions of dollars in property damage. Doug Lowe is the owner and operator of a storage facility in the rural, peaceful town of Trimble, Missouri, near Smithville Lake. His life today is a sharp contrast to 50 years ago, when he was just beginning a career at KCPD as a 21-year-old rookie officer before the race riots began. "Kind of scary, but you know, you pick up things fast," said Lowe, who spent 23 years with KCPD. 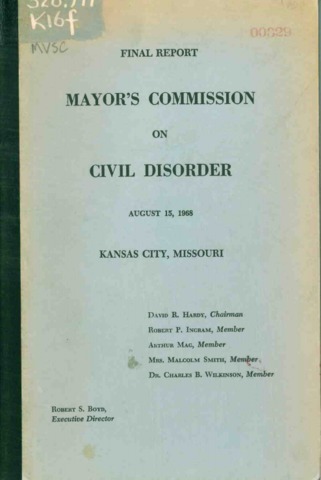 Following the riots in April 1968, then-Mayor Ilus "Ike" Davis' Commission on Civil Disorder put out a final report in August about how to prevent a similar incident from happening again. One section of that report focused on the police department. The commission concluded there was "a frightening shortage of officers to police our city." At that time, the commission also set a goal of hiring at least 1,500 police officers — about 500 more officers than the roughly 1,000 officers KCPD had in 1968. Half a century later, KCPD is still falling short of the commission's 1968 goal. "Most of the people want the police to do their jobs, but there's just not enough of them," Lowe said. In its most recent history, KCPD has experienced a downward staffing trend. At the end of 2017, the department had 1,282 sworn officers in its ranks. Even with a new recruiting class, officers' retirements are expected to leave KCPD short of 1,300 officers by the end of 2018. "We're in a different place today than we were decades ago, but our staffing levels have not appreciably changed," Kansas City Police Board President Nathan Garrett said. In the decade from 2007 through 2016, KCPD averaged 1,394 officers. The peak in officers came at the end of 2013, when the department had 1,427 officers. 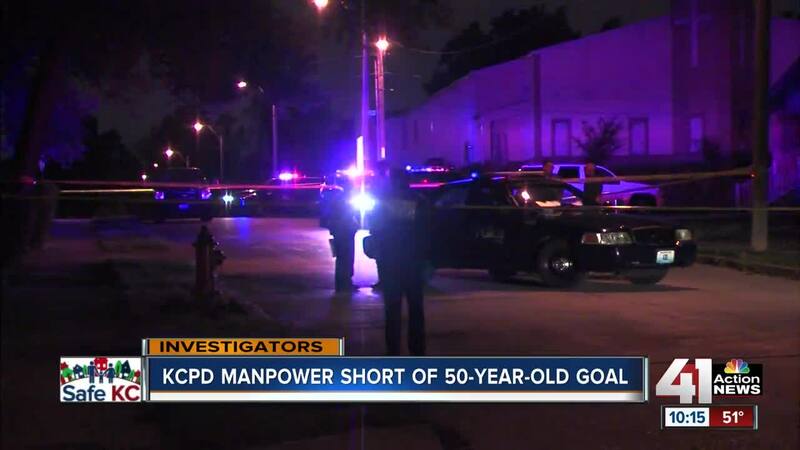 However, it was still short of the 1,500-officer goal set in 1968. In 2013, with the largest KCPD staff in more than a decade, there were 100 homicides reported in the city. So far in 2018 , there have already been 96 homicides, with more than three months left in the year. "I don't know the number in and of itself is as much of the issue as making sure the departments are adequately staffed to do the job well," Kansas City Councilwoman Alissia Canady said. “We also have to take a very strategic look at how we adequately staff our police department to make sure they’re responding and doing their job effectively," she said. The city's budget for KCPD is also generally down, excluding the pension fund. The department's 2016-17 budget was its lowest since 2011. Its current operating budget is lower than it was in 2009. But Lowe said that the budget numbers don't tell the whole story. Today, Kansas City's population is estimated at roughly 488,000 , about the same as it was in 1968. But the city has added more square mileage since then, growing from 314 square miles in 1968 to about 320 square miles. To cover the additional territory, KCPD has added a Shoal Creek Division and a North Patrol Division. Lowe said that 50 years ago, there weren't nearly as many specialized units as there are now, which take officers away from patrolling the streets. Police units such as cyber crimes, the gang squad and crisis intervention teams didn't exist back in 1968. Lowe said because of that change, about 60 percent of KCPD officers in 1968 were part of the Patrol Bureau, which is the bureau responsible for responding to service calls, taking crime reports and enforcing traffic laws on the streets. According to KCPD's 2017 annual report , less than half of the department, including non-sworn personnel, were part of the Patrol Bureau. A KCPD spokesman said Chief Rick Smith has recently emphasized an increase in the Patrol Bureau staff. Including officers and non-sworn personnel, the Patrol Bureau has grown from a staff of 922 at the end of 2017 to 944 currently. But Lowe said it's not nearly enough to address a troubling violent crime problem. "The Kansas City, Missouri Police Department has become stagnant on officers," he said. Garrett, the police board president, said it's not that simple. "We'll always need more officers on the street. But we have to balance with the city and the budget and the demands and the pushes and the pulls," Garrett said. In addition to adding more police officers, the former mayor's Commission on Civil Disorder in 1968 also recommended a second big change: getting rid of state control of the police board. But 50 years later, Kansas City is the only major city in the country still governed by a police board appointed by the state's governor. "I think that is something we probably should look at again, particularly as violent crime continues to increase, to make sure we're having people making decisions that have skin in the game," Canady said. Lowe disagrees with the councilwoman. He believes if local officials ran the police department, there would be more politics at play than under state control. "I think it would be a big mistake. Politics has no place with the police department. It dirties it up, so I'm not in favor of that," Lowe said. Garrett said he takes his role as president of the police board seriously and he doesn't intend to make a case for or against state control of the police department. "I've been appointed by the governor as the other folks have. As long as that's the case, I intend to do as good a job as I can fulfilling that role and those responsibilities," Garrett said. "If folks want to change that, that's not something I intend to be an advocate for or against." Fifty years ago, a commission appointed by the mayor made two key recommendations for the police department after a year marred by violence and racial tensions. Today, both of those recommendations have yet to be met, and violent crime remains a problem for the city. At the end of 1968, after the race riots, KCPD records show that there were 92 homicides reported in the city. In 2017, there were 150 — a 63 percent increase from 1968. The final total for 2018 is unknown, but so far the city has seen 96 homicides this year. With more than three months left, the city has already surpassed the total number of homicides in 1968.